Tony Low is no stranger to those who remember and are familiar with the Cheepskates, as he held the multiple role of singer, bassist and songwriter in that wonderful East Coast band that played a big part in the thriving sixties garage punk revival of the eighties. Following the demise of the Cheepskates, Tony performed in an outfit called Static 13 before embarking on a solo flight in the late nineties. The year 2000 saw the release of his very first disc, an EP titled Dandelion In The Year Of The Rooster, and now here he is with Sleight Of Hand, a full-length album flush with depth and purpose. Spilling forth with naked emotions, Sleight Of Hand projects a lightly-battered psychedelic folk pop temper that glimpses back into the past while addressing the present at the same time. An organic affair, the record is pronounced by a raw appeal drafted of melancholy visages. There's lots of great stuff to pick from on Sleight Of Hand, but tracks like "Rev," "When The Good Times Go Away," "New Millennium Drinking Song" and "Rat Behind The Wall" tend to have a certain spark that separates them from the other numbers housed within. An assertive remake of a Phil Ochs tune, "Chords Of Fame," is also included on the album. Listen closely to Tony Low - he has something to say and says it well! Tony's new disc is absolutely sparkly. With a gentle Bryan MacLean-ish voice, he thickens up the sound with layers of harmonies and guitars. Very 60's influenced folk-rock, but with a hint of that modern LA power-pop thing makes this disc devastatingly intriguing. The real strengths here are the ornate vocal arrangements blended into and perfectly against the meshy guitars. Throw in a lively version of Phil Ochs' classic "Chords of Fame", and you got one helluva disc. The discs' finale, "I Will Listen" is a Moody Blues meets Love masterpiece, chock full of bells and whistles including a hidden scratchy operatic jewel at the very end. Classic! Former Cheepskates/Static 13 member Tony Low searches for success out west with a catchy collection of time-warped (Blues Magoos, Byrds, The Move, Love, The Magic Lanterns, Nazz, Crabby Appleton, Pet Sounds Beach Boys, The Monkees, Moby Grape), late-60s Am radio "underground" pop/rock/psychedelia/folk that flows from track to track on wings of the grooviest patchouli. Oustand...uhm...Far freakin' out! 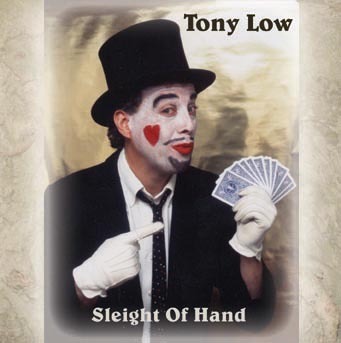 Low was one of the main men of the excellent late '80s power pop band The Cheepskates, and on his first full length, Sleight Of Hand, he proves that he's more than a one trick pony. This disc is chock full of tunes which call to mind that wonderful hybrid of folk, psych, and garage which can be found gracing legendary compilations of '60s music like Pebbles, Highs In The Mid Sixties, and Acid Visions (in keeping with this '60s theme, Sleight Of Hand is recorded in re-channeled stereo!). Among the best are "New Millennium Drinking Song," in which the alternating descending/ascending melody lines reflect the duality of joy and sorrow one finds in inebriation, and "Rat Behind The Wall," which could go down as a folk/garage classic. For the most part, Sleight Of Hand carries a mournful tone, as expressed most eloquently in "When the Good Times Go Away," "Sleight Of Hand," and "Girl," but the countryish "Chords Of Fame" and "When I See That Girl," with its playful apeing of "Downtown," do show a lighter side. Tony Low is probably best known as a former member of garage-psych-pop legends The Cheepskates. Now, at his own pace, he’s carving out a reputation for himself as a solo performer. Sleight Of Hand is his second solo release (the first was an EP from 2000) and continues his flirtation with classic 60s and 70s pop songwriting, all recorded on a budget but not lacking in charm and with enough hooks to satisfy the most demanding of pop fiends. Beatles, Buffalo Springfield, Beach Boys and Badfinger provide the "B" band references and for something a little left of field, I’d like to state with some certainty that there’s a Mighty Lemon Drops album or two in Low’s collection. Low has had a hand in most of this album - writing, playing, producing, arranging and ultimately self-releasing. It’s a sad indictment of the music industry that pop craftsmen such as Low are demoted to the sidelines while the grinning monkeys who make up today's pop royalty reap the accolades. Fortunately, it’s a proven fact that the chirpy little bastards to torture us weekly on Top Of The Pops are only eighteen months away from cocaine addiction, mental breakdowns, suicide attempts and a one-way ticket to Nowhere. Well... it keeps me warm at night! Tony Low, singer/songwriter and musician best known for his affiliation with the Cheepskates, is applying the finishing touches on a marvelous solo album that features catchy original folk-pop, psych-pop and pop/rock tunes. Tony’s Danelectro 12-string guitar even adds some jangly flourishes to several of the songs. Before indie pop fans can enjoy this excellent album, Tony needs to place it with a pop label. Someone in the record business - please give pop music fans a treat and release this disc in 2002! 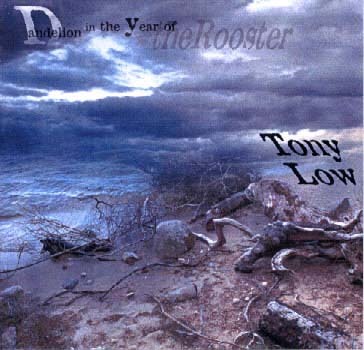 This debut disc by former Cheepskate Tony Low contains a half-dozen decidedly low-key, delicately atmospheric (especially the positively drenched background vocals) extensions into the kind of sonic world most usually populated by meandering singer/songwriter types and over-fortys who've definitely lost some way. However, Tony's years spent toiling alongside head C.skate Shane Faubert assures that the songs themselves -- and their very construction -- take centerstage. There's an eerily apt cinematic quality to this all as well, from Lauren Keswick's hypnotic cover art right on down to the concluding track entitled "Fin." Tony promises "There will be more, so stay tuned..." I will. This is good! We're talking quality rather than quantity, and "Dandelion..." doesn't put a step wrong... late '60s psyche pop with a hint of Julian Cope... a very satisfying ride. Tony Low warms you up with his melodic songs in a way maybe only Justin Hayward or Bryan MacLean could. "This Country Needs a War" is a brilliant offbeat political folksy number, "Falling Away" is a bubblegummy folk melody gem, and "No Ambition" is a love song that you might actually be able to relate to. High quality, and intelligent music! Low (ex-Cheepskates) presents a Beatlesque perspective of Neil Young's folk-country-rock hybrid, that is as heartfelt as it is structured. You certainly cannot quibble with the quality of such choice 70's inflected nuggets like "Captain Sails" and "This Country Needs a War." No way. ...delicate melodies and haunting hues. The vocals are low-key and relaxed. While the orchestration is hypnotic, creating a semi-folkish garage rock fabric that bodes well. Tony is an insightful wordsmith... "Dandelion in the Year of the Rooster" blinks with grace and ease, permitting Tony to show off his musical talent in a most becoming light! "Dandelion..." is dosed on post-surf golden state psych-pop... that long lonesome stuff, one Dylan step away from folk music. And Tony... does it justice.